The book is comprised of four chapters including Mountain, Ocean, Space and People. Mountain corresponds to The Holy Mountain of Avatamsaka. From the sacred mountain of Huayan, entering the realm of reality; conventional truth is spoken in the realm of individual phenomena. 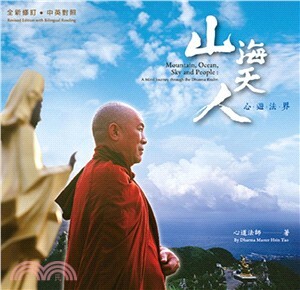 Ocean refers to The Ocean of Vairocana Buddha Nature. Returning to the essence through the sea of Vairocana; Buddha is the realm of nonobstruction between principle and phenomena. Space represents The Space of Awareness. The universal Dharmakaya is ineffable; in the realm of the one principle the essential nature is emptiness itself. People will go for A Person with A Vow to Action. The vows of Samantabhadra span the three times; the realm of nonobstruction between phenomena—this is the Bodhisattva practice. Readers entering the four realms are expected to practice the universal compassionate action of Samantabhadra Bodhisattva. It's the sound of stillness. What is the sound of stillness? It is no sound at all. Flowing in the ocean of death and rebirth. There is no one thought that is real. Listen to the silence, the sound of no sound. Relaxation is to stop and take a break, just to be still and rest! It is the time when you should relax. The great Dharma practice is when you are relaxed.